We are happy to help you! Activate social media for sharing. Data will only be sent via social networks with your consent. The Bose S1 Pro System is the perfect companion for musicians who want to make music in different places. Designed for musicians, DJs and general PA users, the S1 Pro System can be used as a top, floor monitor or primary music system. Weighing only 6.8kg, the portable and rugged S1 Pro System is very light and can be easily transported with the practical carrying handle. The system can be powered by the included battery, which has a life of up to six hours and allows you to play a gig even when there is no power outlet nearby. Special features of the Bose S1 system include the arrangement of the loudspeakers in the cabinet and the automatic EQ. 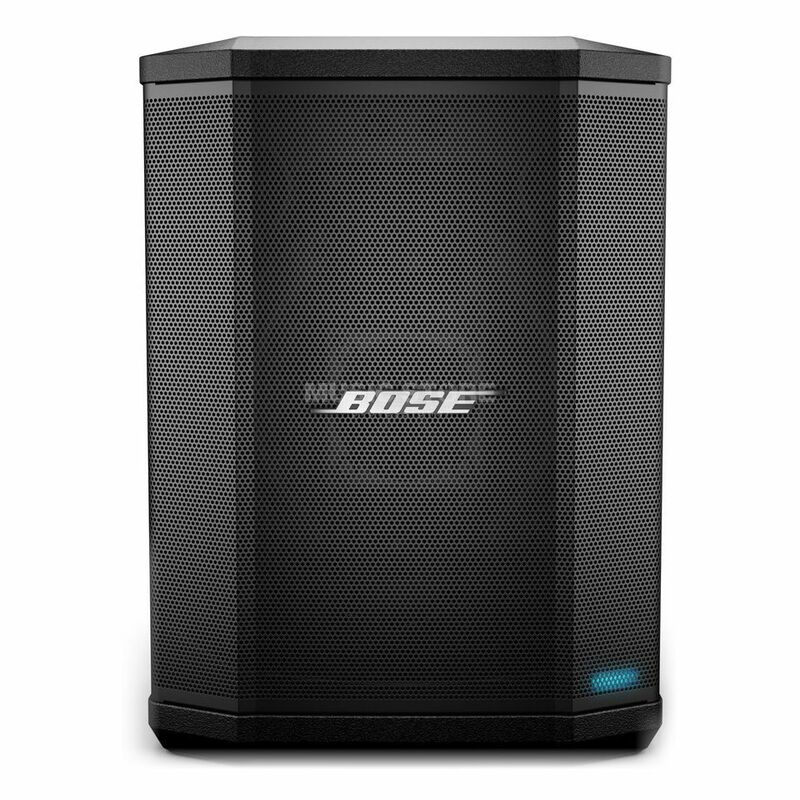 The built-in loudspeakers are arranged in the Bose L1 Compact System configuration and have the components of the Bose F1 built-in. This combination provides a rich and beautiful sound. The automatic EQ uses a special technology to detect how the speaker is positioned and adjusts accordingly. The Bose S1 Pro system has an integrated 3-channel mixer with independent ToneMatch, reverb and EQ settings on 2x channels with an additional channel for wired (3.5mm) or wireless music sources. The 3.5mm input can be used to connect a DJ mixer, laptop, CD player or mobile audio device. Microphones and instruments can be connected via the 2x XLR/6.35mm combo inputs. In addition, the Bose S1 Pro system has a jack line output, which allows you to connect a second Bose S1 Pro system via a 6.3mm jack cable to form a dual speaker mono system. Integrated ToneMatch signal processing ensures life-like reproduction of voices and Guitars, while automatic EQ adjustment provides optimal sound in any orientation. Finally, the Bose S1 Pro system offers high-quality wireless Bluetooth streaming from mobile devices via one-touch pairing. Using the Bose Connect App, you can activate party mode to stream music through a second S1 system or any compatible Bose Bluetooth speaker. The app also has advanced configuration options to help you get the most out of your speakers. No reviews for the selected language available. Would you really like to report this review for misconduct? Describe your experience with this product. Are you sure you really want to delete this review ? Processing the changes may take a while. Subscribe to our newsletters and remain informed! Your newsletter subscription was not successfull. Ensure that you entered a valid email address or try again later. product news with our E-Mail Newsletter! © 1996 -2019 MUSIC STORE professional GmbH. All Rights Reserved.